There is a new UI testing framework in town, White. 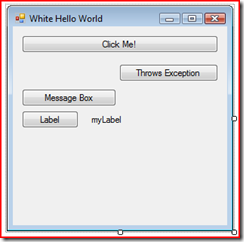 White is analogous to WatiN, it is a wrapper around Microsoft's UIAutomation Library and Windows messages. Supported test applications include Win32, WinForm, WPF and SWT (java). Vivek Singh, of ThoughtWorks, is the project leader and is hosting White at CodePlex. White’s object oreinted API is used simply to control an application, it is meant to be used in conjunction with a testing framework like xUnit.Net, MbUnit, NUnit, MSTest, or even Fit.Net. Ben Hall has written an informative tutorial on getting start with White. It is clear how similar White is to WatiN and Selenium in the examples. #1 Using the Get method, we can give it the type and name of the control we want to access. #2 We can then call the Click method which will move the mouse cursor over to the button and click it. #3 We can then verify that the action was correctly performed, in this case the Name has changed. Ben goes on to show other aspects UI testing: searching for controls by visible text, unhandled exceptions, message boxes, test readability, and helpful tools like UISpy. The tutorial concludes with prase for White. …I'm really impressed with the framework. There are a few missing features, but hopefully they can be added over time, the fact that the framework does multiple different UI technologies is great, means you don't have to worry about what to use to write your UI tests or if your UI deals with the different technologies.